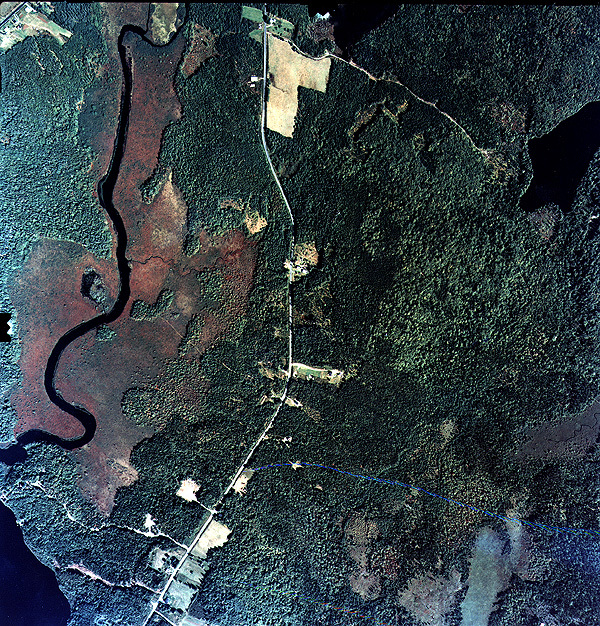 Pleasant Valley is about 10 miles from the town of Yarmouth. It runs 5 miles along highway 340 and with back roads that run about 10 miles back from the highway. The Annis River runs thought the Valley and flows into the lake with the same name. This river was once called Salmon River. Back in the days before the road was built, the river was the main source of travel. It was also used to power the wheels of the mills that were once in Pleasant Valley. One thing that the people had for entertainment was the big soap day. All the bones and grease were saved in a big barrel and let to sit for the summer. When the time came, the barrel was emptied into a large kettle in the back yard. The children's job was to keep the fire burning under the kettle. After a long period of boiling the mixture, it would be strained and let to cool. The grease and the lye were mixed together and then there was enough soap to last until spring. Pleasant Valley was covered with trees that were 2 feet thick at the trunk and stood 75 feet tall. The first trees that were cut down were traded to Yarmouth merchants for food, clothing, tools and other things that were needed. Large mills were built and the river was used to power the mills. Today the mills have the wheels that turn, but they are turned by electricity and diesel power. One of the first mills was built by James Killam Sr. and Freeborn Durkee on the east side of the Annis River near the Durkee Road. The last operator of the mill was Roy Hurlburt until it was destroyed by fire. A stone wall stands there today. Pleasant Valley Lumber Co. owned a water-powered mill that was a benefit to the community. The property was sold to a couple from the United States who demolished the mill. 1936 Levi Hurlburt and sons built a small mill to create employment after the large mill stopped operation. Austin Hurlburt brought a mill from Brazil Lake and moved it over to his property, July 1, 1965, on the Bloomfield Road. His mill started to work on August 15 th of that year and on June 30,1965 was struck by lightning and burned to the ground. He rebuilt the mill and it started to operate on August 15, 1966. It employed 15 to 20 men and produced a large amount of lumber that was used to build most of the homes in the area. In 1976 it became the Austin Hurlburt and Son Lumber Co. Limited. The mill still runs today. The travel to town was a very long trip. Not everyone could go to town for work. So many people started working in their own homes. Some examples of this were the apple orchards that were planted by Roy Wyman on the Killam Road. His trees would produce 400 to 500 barrels of apples in a season. Most of the apple trees are still there today, but are not used for profit. Mr. Wyman also had sugar maples that would provided sap. At one time he can remember having 250 buckets on the go. He would sell his maple sugar to the merchants in town and during the war a lot of it was sent overseas to the soldiers. He also cut and sold his maple trees for firewood. Stephen Hamilton had a farm where he made charcoal by the pit method. What he made was sold to the Grand Hotel, Yarmouth. The charcoal pit was really a mound. The various kinds of wood were cut into four-foot lengths.and placed so the wood leaned into the center. The outer side was covered with chips, sticks, branches, straw and/or moss and six inches of sod or moist soil and set alight. 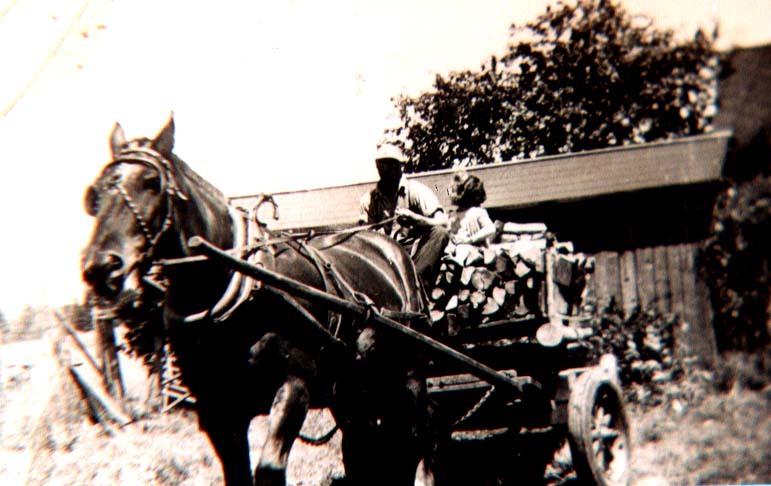 It took 25 cords of wood to make 1,000 bushels of coal and took 10 to 15 days. After burning the coal was laid out and raked and allowed to cool. It took a day to get the cart loaded and another day to go to town. Murray Gray had a poultry farm which he started in the early1930`s which lasted for twenty years. Samuel F. Killam owned a blacksmith shop which was located on the east side of the highway. He blacksmith ironed cart and wagon wheels and made sled runners and shoeing of horses and oxen. The church that now stands at the Pleasant Valley Corner is the Third Yarmouth United Baptist Church. It was dedicated on March 11, 1855. The church was originallly built with a steeple, but it was later struck by lightning and was never rebuilt. The lots in the burying ground were sold in an auction. Four lots in the northwest corner were to be set aside for strangers. School was first held in 1847. There were 86 children in the area at the time. The parents had to pay for schooling so they did not all attend regularly. During the summer girls and younger boys attended and during the winter the older boys and girls attended. On 1846 Thomas Hilton taught for 19 weeks from November to May 1st. He had 42 pupils from the age of six to nineteen. He taught reading, writing, arithmetic and english grammar. He was paid 22 pounds and he would pay 10 pounds in room and board. In May Lydia Crosby would teach 24 weeks. She would have 29 boys and girls, all under the age of nine. She taught reading, writing, grammar, geography and needlework. She was paid seven pounds and five shillings and would pay six pounds, five shillings for board. The Pleasant Valley school burned down in 1887 and was rebuilt a year later. On September 20, 1869 the house of Job Hamilton was struck by lightning and burned to the ground. When the flames died down the bodies of Mr. and Mrs. Hamilton were found on the embers of their bed. They were lying side by side and their limbs and the tops of they heads were burned off. Their daughter was found in the cellar burned to a crisp, she had fallen through the burned floor. In 1862 Miner Durkee`s barn with 14 tons of hay was accidentally lit with a candle and the barn burned. The cattle survived. In 1856 John G. Hamilton and his son were about a mile from his home when he cut a large beech tree. On the way down it hit two other trees and, coming down the wrong way, it hit Mr. Hamilton on top of the head, splitting his head open. When his twelve-year-old son turned back, he was speechless to find his father covered in blood. He ran back for help and Mr. Hamilton was carried home and died five hours later. He was thirty-six of age and left a widow and six children. Please tell me how I can reach your contributor. Lillian Goudey by e-mail. Thank you.